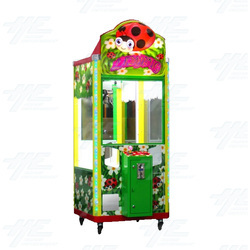 The Ladybug crane machine is a premium quality machine with a strong and durable steel cabinet from Tommy Bear. It is manufactured in Taiwan and has a number of features that make it superior to many other crane machines in the market. This premium crane machine features bright LED lighting and happy music to attract players, and it also features five modes of play to diversify operations. These modes include Vending, Gaming, Accumulating, Time Limited and Random Gaming. The PCB also uses DIP switches to operate the Test Mode. The machine features a removable operations door, through which the PCB drawer can be accessed, that allows for convenient access and maintenance. Also maximizing convenience is the ability to digitally make game and system adjustments Claw Strength, Winning Ratio and other functions using the control panel. The stand out feature of this crane machine is the drop tray sensor calculates the machine's payout percentage. The sensor keeps track of how much money is inserted into the machine and how many prizes are dispensed on a weekly basis, while a carefully concealed cash box acts as a safe guard against theft. The small, kid-sized cabinet has been designed to specialize as a kids machine and allows operators to mix a variety of candy and toys in the one machine. These crane machines can also be fully customized with your company's colours, logos and artworks. The Ladybug Crane is a premium quality, Taiwan made machine and comes standard with a Taiwan coin validator, but can be shipped with bill acceptors or ticket dispensers as optional extra accessories. This premium crane machine features bright LED lighting and happy music to attract players, and it also features five modes of play to diversify operations. These modes include Vending, Gaming, Accumulating, Time Limited and Random Gaming. The PCB also uses DIP switches to operate the Test Mode. The machine features a removable operations door, through which the PCB drawer can be accessed, that allows for convenient access and maintenance. Also maximizing convenience is the ability to digitally make game and system adjustments Claw Strength, Winning Ratio and other functions using the control panel. The stand out feature of this crane machine is the drop tray sensor calculates the machine's payout percentage. The sensor keeps track of how much money is inserted into the machine and how many prizes are dispensed on a weekly basis, while a carefully concealed cash box acts as a safe guard against theft. The small, kid-sized cabinet has been designed to specialize as a kids machine and allows operators to mix a variety of candy and toys in the one machine. These crane machines can also be fully customized with your company's colours, logos and artworks. The Ladybug Crane is a premium quality, Taiwan made machine and comes standard with a Taiwan coin validator, but can be shipped with bill acceptors or ticket dispensers as optional extra accessories.